The iPad isn’t launching until Saturday, but many of the apps for it are already live (even ones under embargo). 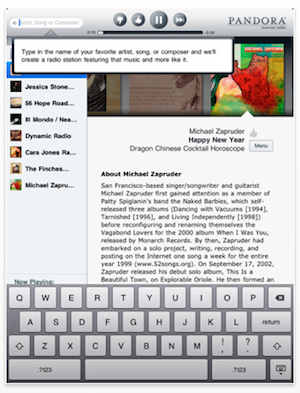 That includes one of the most popular apps of all time for the iPhone: Pandora. Based on the App Store description and screenshots, you can expect Pandora to be one of the top apps on the iPad as well. 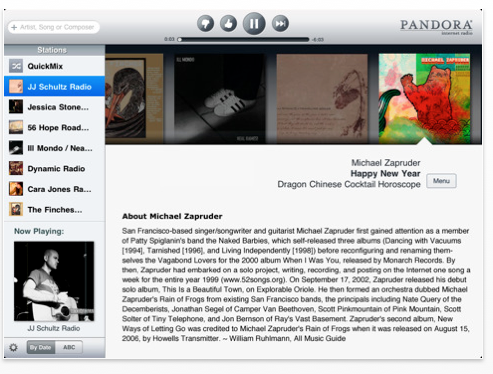 Version 3.0 of Pandora is a Universal app, meaning it includes builds for the iPhone and iPad . Those who have the app installed (likely most of you with an iPhone or iPod touch) probably downloaded the update automatically today through iTunes. So what’s in it? Well, obviously there is a completely redesigned interface for the iPad (see screenshots below). 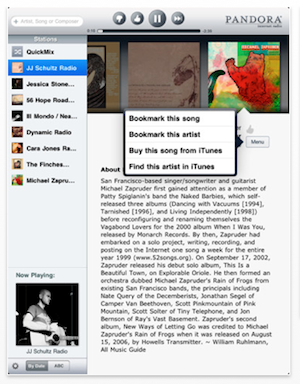 But Pandora has also added album artwork to the station list across all the platforms. 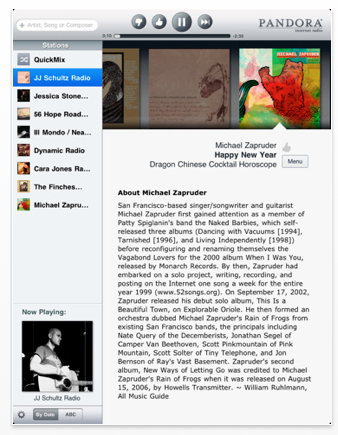 Perhaps most significantly, Pandora has also improved the audio streaming across the board. This means faster start times and fewer dropouts. The iPad version takes advantage of the large 9.7 inch screen of the device. Rather than having to switch views to see things such as your stations, they can reside on the left hand side of the screen as your album artwork and artist information is on the right hand side. Artist information is a particular area of emphasis with this new app. The top player looks similar to iTunes now, with play and pause buttons, as well as thumbs up and thumbs down buttons. There is also an easy-to-access search box along the top. On top of the new iPad app, Pandora CTO Tom Conrad tweeted earlier today that the service has just signed up its 50 millionth user (up from 40 million this past December). Good timing, they’re potentially about to get a whole lot more from this new device. Find Pandora in the App Store here. It’s a free download.